The spectacular Neolithic decorated Cruciform Passage Grave of Barclodiad y Gawres is situated on a crag at the highest point of the Mynydd Cnwc headland overlooking Trecastle Bay and the Irish Sea, to the south of the coastal village of Rhosneigr. Tombs of this kind are usually only found in Ireland, particularly in the Boyne valley area. Other Cruciform Passage Graves have survived in Britain, but they do not possess the characteristic decoration found in the Barclodiad y Gawres monument and the Irish tombs. 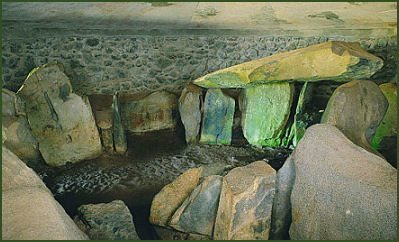 The name translates into English as the 'Giantess's Apronful', the burial chamber is thought to be around 5,000 years old, analysis of tree pollen from beneath it suggest that the tomb was surrounded by thick woodland when it was built. The monument features some of the oldest artwork in Europe. Inside the chamber are six carved stones, decorated with a range of patterns including spirals, cup marks and zig-zag features. Five of the stones were discovered during twentieth century excavations and the 6th in 2001. 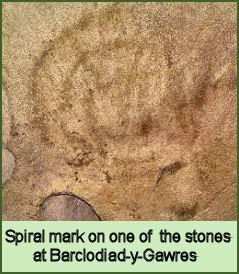 The purpose of these marks is not known, but they probably had some ritual function. The monument was damaged in the eighteenth century, when much of its structure was removed during its use as a stone quarry. Excavations were carried out by Powell and Daniel between 1952 and 1953, after which the chamber was re-roofed with concrete and covered with turf to appear as the original structure would have. During the excavations two cremated young male burials were found within the south-western side-chamber. The entrance to the chamber takes the form of a passage carved out of the hill and is now gated. The passage of the original chamber tomb measured around 7 metres long, it was both lower and narrower than the modern entrance way. The chamber measures about 6 metres in diameter and has a terminal chamber and two side chambers, which forms a cruciform plan. The south west chamber had been blocked off with stone. The smaller chambers were once roofed with capstones, but only that of the terminal chamber survives to the present day. 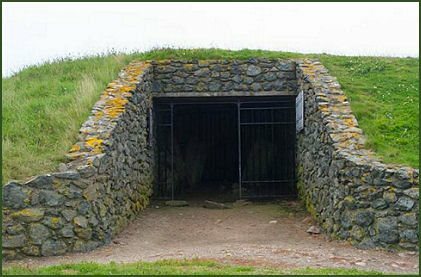 The main chamber, being too wide to have a capstone roof, probably had a roof of a corbelled construction, another feature in which it bears similarities to the Irish tombs. Traces of a long lasting fire have been found in the central chamber. This had been quenched by a 'stew' or magical potion, consisting of wrasse, eel, frog, toad, grass-snake, mouse, shrew and hare, then covered with a quantity of limpet shells and pebbles. The burial chamber is in the care of the Welsh heritage organisation Cadw. The chamber may be entered from April to October at weekends and bank holidays, a key is available at Wayside Stores in Llanfaelog, located 1 mile to the north of the chamber, visitors will be accompanied to the chamber by a member of staff. There is also a full scale replica of the inside of the chamber at the Oriel Ynys Mon Museum in Llangefni.